Nasturtium, Marigold, Oregano, Corn, Pumpkin, Radish, Squash, Beans and Morning Glory. Sow seeds 1 inch deep in rows, or in hills spaced 6 feet apart. After 2 weeks, thin to 2 plants per hill. Fruit size varies with variety. 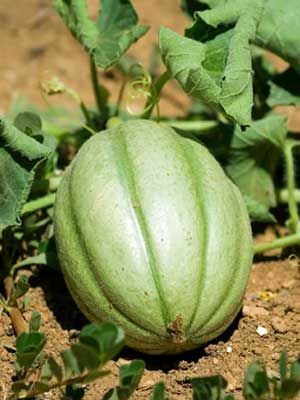 Small melons mature quickly and take up less space compared to huge varieties. Harvest when sound holow if tapped hard. Wipe clean and store indoors.